If you would like faculty members to provide the Board of Admission with a formal review of your visual art, music, or theatre work, please submit an Arts Supplement. Wellesley College accepts Arts Supplements via SlideRoom. 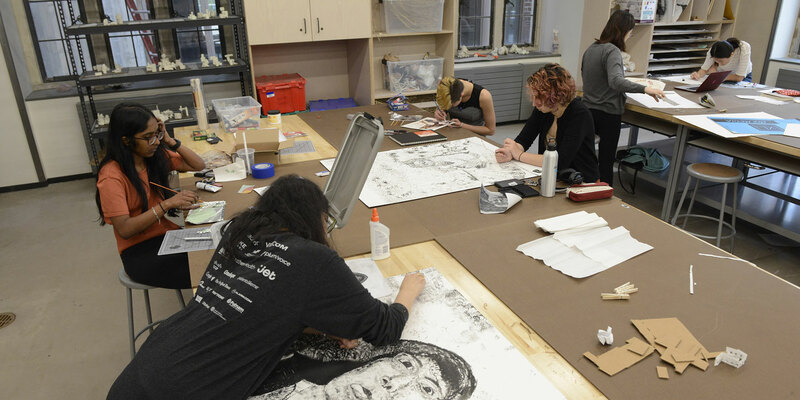 Please note that Wellesley does not accept the Common Application Arts Supplement. You may create a Slideroom account at any time after September 1 whether you are using the Common Application, Coalition Application, or Questbridge Application. Please Note: If you are using the Common Application you must first submit your Common Application to Wellesley before submitting your SlideRoom portfolio. An error message will appear on SlideRoom if you try to submit your portfolio before submitting your Common Application. When you create your Slideroom account choose one of the two categories listed below and then follow the online Slideroom directions. All Arts Supplements must be submitted via SlideRoom. Please do not mail any CDs, DVDs, slides, screenplays, etc. to the office. They will not be evaluated or returned. Please do not send dance portfolios, short films, or creative writing samples. If submitted, they will not be reviewed. Include your full legal name, address, high school name, birth date, and your application decision plan in the body of any email you send to us. If wish to provide letters of recommendations from music, art or theatre teachers, they should be submitted online by your teacher via the Common Application or Coalition Application. You should invite them under the “other” recommender category. Wellesley only accepts electronic portfolios. All artwork should be labeled with title, medium, and dimensions. If you will be submitting any video or moving images, you may upload these files to Vimeo and linked through SlideRoom. Please do not link to YouTube submissions and Facebook pages, they will not be reviewed. Your visual arts portfolio should consist of 10 to 20 images, which may include some detail views. Please do not send a visual arts portfolio if you have fewer than 10 works to show us. Short (three-minute) animation or video projects may also be included in the portfolio. Provide a separate list of the submitted work including title, medium, and dimensions (height x width x depth). Please also indicate whether the work was made as part of a class assignment or under the direction of a particular teacher. Also, please indicate if the work was collaborative or if it was installed within a particular context. Save this document as a .docx, .pdf, or other common file format. All materials must be submitted electronically using SlideRoom. Please note that a $10 fee is assessed for submitting a Visual Art Supplement. The most useful portfolios include examples of freehand drawing, both as finished works and quick process sketches. Work completed in the last two years is most relevant to our assessment. Be sure to test your files/links before submitting. Do not use sites that require a password or account login. You must save your recording(s) in a common audio file format and upload them via the SlideRoom website. In lieu of attachments, you may upload your recording to a site such as YouTube and link to the video within SlideRoom, provided the sound quality remains high. Please do not link to any Facebook pages, they will not be reviewed. Submissions should consist of a solo performance of approximately 10 minutes of performance. We prefer that there are at least two contrasting pieces or excerpts. These can be of any style or genre. All materials must be submitted electronically using SlideRoom. Please note that a $5 fee is assessed for submitting a Music Supplement. Choose pieces that show you at your best, while keeping in mind that contrast (different styles, varied tempos, technical variety) is important. Sound and video quality must be good to excellent for our faculty to properly assess your work. Poor quality video: make sure we can see and hear you clearly and that you take up most of the screen. For actors and/or directors: A video recording of your performance(s) and a document detailing your role in the production, date of production, theatre ensemble group, and other relevant information for each performance. You may save your recording or documents in a common file format and upload them via SlideRoom. In lieu of attachments, you may upload your recording to a site such as YouTube and list the web address in SlideRoom, provided the quality remains high. Submissions should consist of approximately 10 minutes of performance. You may submit excerpts from different shows. Choose selections that exhibit your range of skills and offer contrasting views of you as a performer. Video how-to’s: Pay close attention to the background of your video clip. Any distractions such as random behind-the-scenes crossings or overly busy backdrops can detract from the focus, which should be on you. Also, be sure to "slate yourself" with your name, selection, and author before beginning. You may introduce both pieces at the start rather than interrupting them as you segue from one to the other. Lastly, please take the time to find someone with good camera skills to help you create and edit the video. For Theatre Supplements, quality definitely outweighs quantity. Submit a written sample of your work, such as an excerpt of a larger production or a one-act play. Select a piece, or a portion of a piece, that shows you at your best while keeping your submission to a reasonable length. Any supplementary journalistic support material is also welcome. For instance, if a publication covered you and your writing, it is relevant to this application. Please submit both working drawings and high-quality photographs of the sets you have designed. Save your materials as a single portfolio in pdf form. Submit all materials electronically using SlideRoom. Please note that a $5 fee is assessed for submitting a Theatre Supplement. Be sure to test your files/links before submitting. Do not use sites that require a password or account login. Do not send recordings where you perform as part of a group; we must be able to see/hear your individual talents.